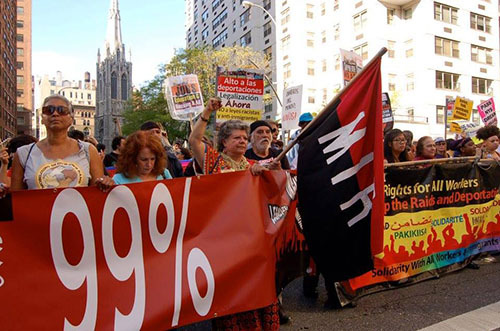 May Day Events around the U.S.
Workers and Migrants of the World Unite! We have nothing to lose but our chains! Join workers around the world on Sunday, May 1st, as we show that there is another world possible, a world where forced migration due to neoliberal policies no longer happens, where refugees and migrants don’t have to flee their homelands and go to countries as exploited workers, where refugees and migrants are not criminalized, where families are not torn apart, where families do not have to fear deportation, detention and raids, where black lives matter, where our workers have sustainable wages, where we are liberated. Join one these events happening around the country and around the world on Sunday, May 1st, and make your voice heard! Our May Day flash sale with 50% off selected books (with free worldwide shipping and free bundled ebooks where available) runs until Monday, May 2 at 11pm ET. On May Day We Vote In The Streets For Justice! March for Legalization, Housing, Education, and a Living Wage!